Native Texan writer Linda Francis Lee now lives in New York City, but she has set several of her books in Texas, including The Devil in the Junior League. Her newest book, Emily and Einstein is set in New York City, but the main character, Emily has a down-to-earth, Texan vibe. Emily is blissfully happy in her life as an up-and-coming book editor. She is madly in love with her new husband, Sandy, and busy remodeling their apartment in the fabulous Dakota building. Then Sandy is killed in a tragic accident, and Emily discovers her life was not as happy as she thought it was. Sandy was hiding many things from her, not the least of which was the sham of his lies and broken promises, and now Emily is in danger of losing everything. While Emily deals with the hurt from Sandy’s death and his betrayal, she is on the verge of losing herself. 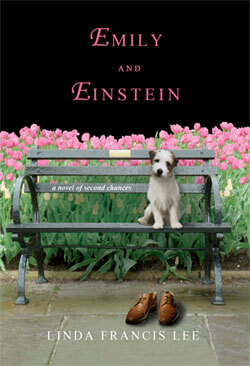 Then she meets Einstein, a scruffy stray dog who charms his way into her heart and her life. Emily may not feel like saving herself, but Einstein is determined to make sure she does. With the help of the oddly charming Einstein, Emily starts the difficult journey to deal with the ghosts in her past—and to make her future all she’s ever dreamed of. Emily and Einstein is a magical, heart-warming book. Ms. Lee brings New York City to life in a way that has nothing to do with the hustle-and-bustle of the city, but with its colorful, larger-than-life inhabitants and quaint settings. The book alternates Emily’s heart-wrenching thoughts and feelings, with the more pragmatic Einstein’s. This story of redemption and love is well worth the read.